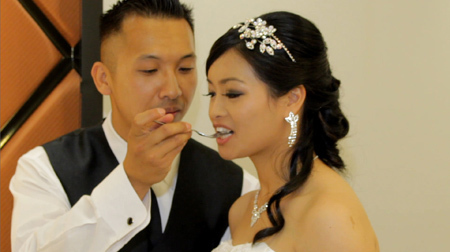 We just finished a 14-hour wedding yesterday using the Canon Rebel T3i for the first time. We use RODE VideoMic connected to the camera. Being able to disable automatic audio gain and view the audio meter display is a big plug. The sound recorded in T2i gets worst when picking up sound from loud speakers. With T3i we can adjust the recording level to avoid any clipping. The 3X Cropping Zoom is the best feature (It is not available on Canon 60D). It requires a few button clicks to get to it. We can get good range from wide angle view to great close up shots even with a standard 17-50mm F2.8 lens. 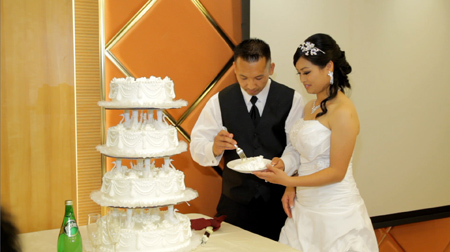 For example, at Cake Cutting, the wide angle view captures the scene with the bride and groom and the cake table. Then activating the 3X digital cropping zoom for good close up when they feed each other. The articulating LCD screen makes shooting a lot easier. Doesn't have to be on eye-level at all time. In certain scene, we just raised the tripod center column goes above everybody's head be able to view the LCD screen without much guessing. When using with slider, the LCD screen can be adjusted to any angle for a clear view. Lastly, there isn't any single incident of overheating all day at all. Very please with the result. Posted by James Tsukamoto on 5/29/2011 3:19:00 PM Yeah, it was really nice shooting without any overheating! Posted by Daniel Regueirq on 7/31/2011 10:29:00 PM Does the Canon T2i overheat offen? Replied by LA Color Pros Yes, T2i got overheated very often during summer times.